I wasn’t really sure what to expect from a space thriller when going into this books but I can now confidently say that I.Am.Here.For.It! 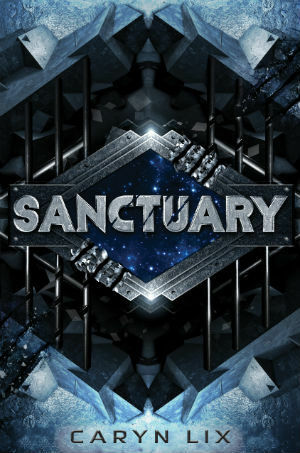 Sanctuary gave me outer space, excitement, feels, and adventure. The plot threw me for a bunch of loops while reading which helped a very thick book feel like it flew by. Just when I thought I knew exactly where things would be going for the rest of the story something would throw a wrench in that and my heart would be racing all over again. The plot was interesting but also exciting. If this ever became a movie I would probably jump out of my skin 20+ times. I also love how open the ending is and having seen that it’s listed as Sanctuary #1 I can’t wait to read more! The characters also grabbed me from the very beginning. I really connected with Kenzie’s desire to excel at everything she does and wanting to perform well at all that those around her expected of her. I was the same way in high school and totally related to her stress. I also ended up really loving the prisoners’ development once they become main players in the story. They were all so distinct and vibrant that I became just as invested in them as I was Kenzie. Sanctuary is the complete package. It gives you all the sci-fi vibes you could want with tons of adventure and the complexity of human nature and relationships mixed in. There are characters you can’t help but care about and a plot that gets your heart rate up every time you think there’s finally a moment of safety. If you could cast your book with any actors and actresses, who would play the leading characters? I have such a tough time with this question! The idea of Sanctuary on the screen seems so far away that it doesn’t even feel real. I don’t really have a dream cast or any specific actors and actresses in mind, but I do have specific images in mind for a lot of the characters, although I tried not to project that too much into the story, because I want readers to be able to fill in the blanks with their own imaginations. That said, I think the coolest thing in the world would be to see Sanctuary animated, maybe in anime style like Kenzie’s beloved Robo Mecha Dream Girl 5! The only character I ever strongly considered in terms of an actor was Kenzie, and for her I would say Saoirse Ronan. When I picture Kenzie I always thought Ronan had the features I would want for that character. And of course, Mia is based on a character I used to roleplay in a Pathfinder game, so when I think of her, I always picture a slightly elf even though that’s not remotely how Mia is described! That’s the funny thing about creating characters. You turn them loose in the world and even though they’re all a part of you, you relinquish aspects of them – who they are, where they come from, their appearance – to your readers. And I think that’s a really cool thing, because it’s what makes writing a collaborative experience. I may have written the book, but it’s the readers who give it meaning. All of that is a really long winded response to the question! To sum up, I don’t really have an ideal cast in mind, but I think it would be incredible to see readers’ interpretations of the characters in response to that question.